I've been promising to post about this for a while so here it is finally. Yes, I now have a brand new MacBook This is a MacBook 6,1 with an Intel C2D 2.26GHz CPU, 2MB of RAM, 250GB HD, Airport Extreme 802.11 a/b/g/n wifi and a NVIDIA GeForce 9400M graphics card. 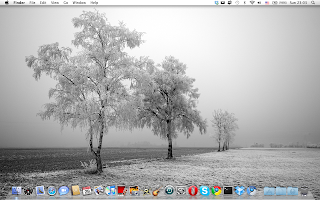 The installed OS is OS X 10.6 (Snow Leopard). Up to now, I have successfully resisted the temptation to partition the HD and install various Linux distros. Indeed, I want to try to overcome the shameful neglect of OS X that has beset my computing efforts since I got my first Mac more than two years ago. I have to say that this machine really impresses me. Everything (or nearly so) just works. Booting from cold takes 40 seconds to a completely usable Desktop. A complete shutdown takes place in an amazing 4 seconds. While the boot is not quite in the class that Google has in mind for ChromeOS on netbooks, it is still very impressive. Wifi works immediately and only requires the encryption key to be entered (just once) for you never to have to worry about this again (at least, until you move location). There is no firewire socket anymore, which is no loss to me, but I would have liked if they had used the extra space for a further USB port (only two available). All of the built-in apps that I have used have worked very well, particularly iPhoto which I like a lot. I find myself using Google's Chrome or Chromium browsers in preference to Opera mainly because Chrome just seems that little bit faster. I'm also using Notify which is a great Gmail Notifier for OS X. One annoying problem that has been present for sometime is that OS X 10.6 still does not support the Brazilian Portuguese language on the keyboard. Although a Brazilian flag certainly appears, the keyboard viewer clearly shows that the so-called Brazilian keyboard is no different from the US keyboard. Therefore, I find that I still have to use a Portuguese keyboard to type in Brazilian Portuguese which is inconvenient. Nevertheless, all-in-all, I love this machine and can fully recommend it.